Today I was looking through my deck, searching for the most salient factor for consideration. Up came the Seven of Pentacles and it could not be more fitting for me personally. 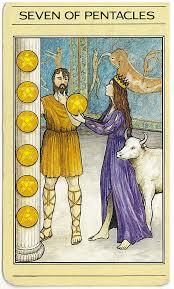 Here we see a figure – to his right stands a pillar with six pentacles, one hand rests gently on it. To his left stands a woman offering a single coin and standing behind her is a white cow. You can almost feel the man’s conflict…does he reach for what she is offering or does he stay with what he has? Opportunity looms on the horizon and this card represents our responsibility to consider carefully the choices before us. Our prosperity is tied to what we put into it, i.e. we reap what we sow. This figure we see facing us has put a great deal into his prosperity. Its health and fruitfulness is directly tied to this effort. However, there is another avenue of growth to be explored. What gets us every time is indecision and inertia. As this man holds his position, uncertainty turns to inaction, inertia and disassociation. There is a school of thought that states when we are faced with a choice or not making any choice, that somehow inaction clears us of responsibility when we don’t know which action to take. However, there is another school of thought, more accurate I feel, that indicates inaction is still a choice and one we have to be prepared to take responsibility for. Inertia can strike in many ways. The one i talk about here is that you may find yourself unable to change the path you find yourself walking and proceed ever forward into the same spot on the proverbial wall time and time again. When something no longer moves in any direction, then there is no opportunity for growth. Careful consideration and close examination of all the options will see one through this challenging time. Beware of inaction and commit yourself to the path you choose once the choice has been made. Fruitful prosperity is still possible but only if forward momentum is maintained.